It’s good to enjoy family occasions and some party evenings over the festive period with all the delicious food and drinks on offer, relaxing our usual ‘healthy lifestyle’ rules just a little (or even a lot!). None of us wants to be the odd one out at the party, the one who declines all the goodies on offer for fear of gaining weight – but it can soon pile on if we are not careful. Here are some tips from Ben Purcell, Bathurst Chiropractor that will help you participate in all the festivities and still begin the New Year in great shape. The majority of people keep that weight on – we don’t lose it once the festivities have ended. The weight gained tends to go on around the belly where it is (unfortunately), linked to an increased risk of cardiovascular problems and Diabetes Type-2. Ben’s first piece of advice is not to make yourself (and those around you), unhappy because you are trying to lose weight over Christmas. He says that the best you can hope for is to make healthier choices from the food and drink on offer and maintain your weight rather than gain weight. Don’t deny yourself all the treats on offer – balance these with ensuring that the majority of what is on your plate comprises healthy options (fruits, nuts, seeds and veggies). When you know you are going to be tempted with delicious canapés and rich food, eating a healthy snack before you go out will help your willpower. It doesn’t have to be anything fancy, whole grain cereals or low fat yogurt will do. Traditional vegetables over the festive season are a great source of health-giving and immune-boosting anti-oxidants. Adding more sprouts, broccoli, red cabbage, etc., to your plate and fewer ‘roasties’ will also help reduce your calorie intake. Nuts are also traditional at Christmas. Tree nuts are a good source of essential Omega-3. These important fatty acids are beneficial for the health of both the brain and the heart. Choose unsalted nuts though or eat the salted kind in moderation as additional dietary salt can lead to elevated blood pressure. The festive season is also, traditionally the time to eat many foods flavoured with spices. These spices can be good for our health too. Ginger for example can help a ‘windy’ or upset stomach and has anti-inflammatory benefits, as does cinnamon which may also be of benefit in regulating blood sugar and reducing sugar cravings. 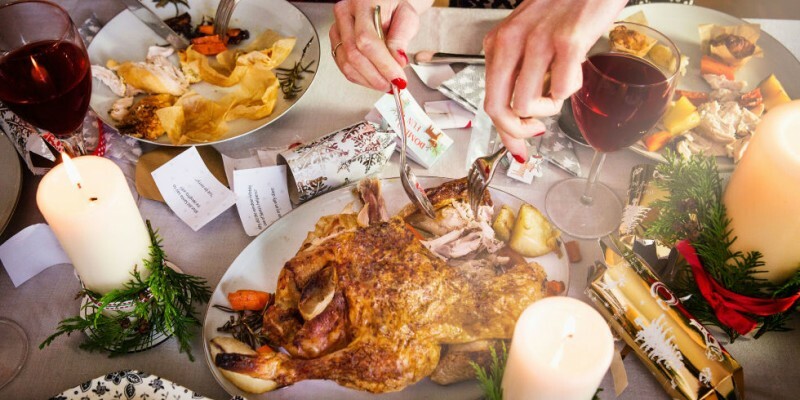 Many traditional foods are loaded with Saturated Fats: Reducing the amount of rich fruit cake, mince pies and Christmas pudding we eat and cutting back on roasted vegetables can ensure we still enjoy everything that is on offer but reduce our risk of raised cholesterol and increasing our waist size too! The same festive treats mentioned above, are also high in Sugar: For home-bakers, it is possible to reduce the amount of refined sugar in these treats by substituting honey, agave nectar or Stevia. Chocolates are the downfall for many of us over the Holidays – but plain or dark chocolate (70% Cacao or above) will satisfy that chocolate craving more quickly. You can also tell yourself that it is better for you as it contains polyphenols that also have powerful anti-oxidant properties. Good food is often accompanied by delicious drinks, so our Alcohol intake is something else to keep an eye on. Avoiding ‘top-ups’ (only refilling the glass when it is empty) can avoid any confusion over how many drinks you have had. Also, be aware that home measures are often larger than pub or restaurant ones. You can limit your alcohol intake by sipping water and by drinking a soft drink between alcoholic ones. Drinks can also be a source of many extra calories that often come from the ‘mixers’ added. Substituting sparkling water for soda and adding natural fruit for flavour is a great low-calorie option. Ben Purcell, your Bathurst Chiropractor, wishes you a very happy Festive Season and a healthy New Year. We are only a phone call away, so please ring (02) 6331 1004 if you need to make an appointment.